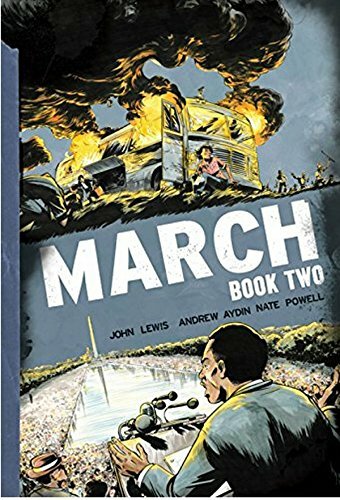 I don’t know that I’ve ever seen a book on Goodreads with a higher rating than this one (4.7/5 stars), but that’s not why I read the conclusion to John Lewis’ March trilogy this weekend. It’s been a while since I’ve seen a book win so many awards, (4 at ALA’s Youth Media Awards announced last week and the National Book Award last year) but that wasn’t why I read it either. I read it because I needed some hope. When earlier this week, I opened a new box of books at school, I breathed a sigh of relief to find March among them. It’s been a rough week, hasn’t it? It’s hard to not feel hopeless every time I turn on the news or scroll through my social media feeds, and after getting a little less sleep than normal due to my husband’s knee surgery on Monday, by this weekend, I was feeling weighed down. Hearing from one of our country’s leading civil rights activists who has really been through it all, that’s what I needed. If you’ve read the first two volumes of March, you know what to expect in this one. The third volume picks up with the bombing of the Sixteenth Street Baptist Church in Birmingham in September 1963, when four young girls died and dozens more were injured. It then carries through the assassinations of JFK and Malcolm X, the killings of the three civil rights workers in Mississippi, Freedom Summer (with the major push to register black voters in Alabama), and culminating with the marches in Selma. It’s a dark story, darker than the first two for sure. There were more than a few scenes that make my neck prickle at purchasing this for middle school. But there’s no way I can let this one stay off the shelves. There’s too many important things in these pages, things that I don’t think my students are aware of. 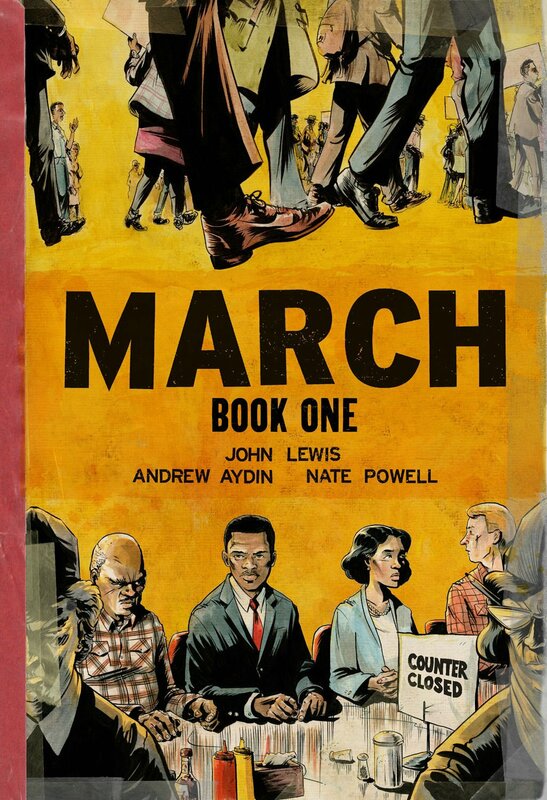 I know before reading the first March, I had very little knowledge of John Lewis and the incredible role he has played in our country’s history (and modern politics), and I was raised in a much more diverse population. It seems as though we teach about MLK, Rosa Parks, maybe Malcolm X in more liberal classrooms, but that’s about the extent of it. The fact that Lewis chose to tell his story through graphic format is genius. Not only does it meet students where they are (in the graphic novel section), but also it brings the reality of the horror of our nation’s past to very bright light. And the thing is, it doesn’t take much to see how relevant this story from 50 years ago is in our current situation. The thing that I think makes this book so powerful, though, is what I mentioned at the beginning: the hope. Lewis does not shy away from the violence, from the language, from the very real darkness he lived through. But interspersed with that darkness are scenes from Inauguration Day in 2009, when President Obama took office. These little glimpses show us that despite all the terror Lewis has witnessed, he knows the value, the purpose, the goal and that it’s all worth it. He knows that those terrible years in the 60s were just the beginning of a lifetime of hard struggle (as is evidenced in his 30 years in U.S. Congress so far), and yet he’s not giving up. He’ll keep doing the work, and so can we. As sad as I am that Obama is no longer in Washington, I can remain hopeful, because Lewis is. And even when he finally does take a well-deserved rest, there will be others there, maintaining the fight. It’s amazing how relevant this story is today. In the first two parts of the planned trilogy, readers of this startling graphic novel series will get a full picture of the life and times of U.S. Representative John Lewis. The only one of the “Big Six” of the Civil Rights Movement still alive, Rep. Lewis partnered with a member of his D.C. staff and a graphic novelist to tell his story to a younger generation. Book One starts with the morning of President Obama’s first inauguration, a day that blends itself in between the stories of previous decades, before going back to John’s childhood as the son of a sharecropper in Pike County, Alabama. Believing it was his destiny to be a preacher, he started speaking his gospel to the chickens he was in charge of on the family farm, but eventually realized that his mission lay elsewhere. While in college, he met with other students who were practicing non-violence in preparation for protests they intended to do at lunch counters that refused to serve black customers. Before long, John was heavily involved, becoming an active member in the Student Non-Violent Coordinating Committee (SNCC), helping to organize the lunch counter protests, movie theater protests, the Freedom Rides to Birmingham and Montgomery, and then the March on Washington for Jobs and Freedom. It is clear from the structure of the book that Rep. Lewis (and his co-writers) meant for the reader to connect the events of the past with today’s current situation. As I mentioned above, snippets of President Obama’s inauguration day on January 20, 2009 appear throughout the text, often overlapping with images or word bubbles from events during the 50s and 60s. Perhaps this project began as a symbol of triumph for John Lewis, showing that all the hard work of he and his fellow civil rights activists paid off as we elected our first black president. I wonder, though, if and how the third installment will be different. As I poured through these pages, I couldn’t help but see images that look haunting like the ones I see on the news and internet today, the words of President Kennedy sounding so similar to those of President Obama in response to another tragedy. Earlier this month, Rep. Lewis spoke in Atlanta with other civil rights leaders, addressing this issue. “I tell you,” he said, “we have a fight on our hands. I happen to think we’re too quiet.” He seems hopeful though, that with some “good trouble and necessary trouble” we can keep marching more toward equality. Let’s hope he’s right. Dark, graphic, yet hopeful. 2 stars.